Terroir is a quality in a food product that synthesizes genetics, location, and human intervention to evoke a “sense of place.” This blog post discusses the notions of terroir in chocolate and the multiple layers of chocolate origins, as well as explores the concepts firsthand with a chocolate tasting that tests whether these factors are discernible to the average consumer in the final product. To describe terroir in chocolate is to recognize the interconnected web of relationships that produce chocolate: from its raw state and growing conditions to the manufacturing process and final moment of consumption and appreciation (Nesto 131). Flavor begins with the genetics of cacao and its precursors are “translated” during the fermentation process into distinguishable characteristics (Presilla 117). Environmental conditions—climate, soil type, topography, surrounding plants—and the chocolate-making process further affects how this cacao flavor is expressed (Martin 2018). In addition, human interaction with cacao influences how terroir is expressed. The final chocolate product embodies a series of actions that shape the final flavor: from deciding when to harvest and choosing certain cacao pods to balancing mucilage-to-seed ratios during the fermentation process and manipulating texture and aroma with roasting and grinding (Nesto 134). For instance, in areas where cacao is harvested during the rainy season, drying the seeds in the sun is not a reliable option. Artificial drying methods, such as over wood fires, infuse smoky and deeply-roasted flavors into the cacao beans, which would not appear in cacao beans from other places where harvest occurs in a warmer, sunnier climate (Presilla 117). Essentially, terroir reflects the identity of the chocolate and its origins. Exploring terroir in chocolate starts with examining the place where cacao beans originate. While terroir in chocolate is an emerging concept, the notion is well-established and widely recognized in the world of viticulture. Like wine grapes, cocoa beans exhibit detectable and distinct flavors between different types and terroirs (Leissle 23). Yet, while parallels can be drawn between the two agricultural products, the comparisons are only useful to a certain point (Presilla 126). The differences between viticulture and enology with cacao cultivation and chocolate-making highlight why terroir is more difficult to express in the latter field. Firstly, concerning genetics, the form of grapevines reflects inherent genetic qualities and each grape is genetically identical to each other. In contrast, the exact connection is tenuous between gene markers and physical morphology in cacao pods. Moreover, in a single cacao tree, cacao pods are not genetically identical to each other (Nesto 133). Secondly, the system of regulation and labeling of raw-material origin is more consistent and widespread for wine-producing grapes than it is for chocolate-producing cacao (Nesto 134). Lastly, growing grapes and producing wine are often done in close proximity to each other, allowing for more control throughout the process. This is certainly not the case with chocolate. 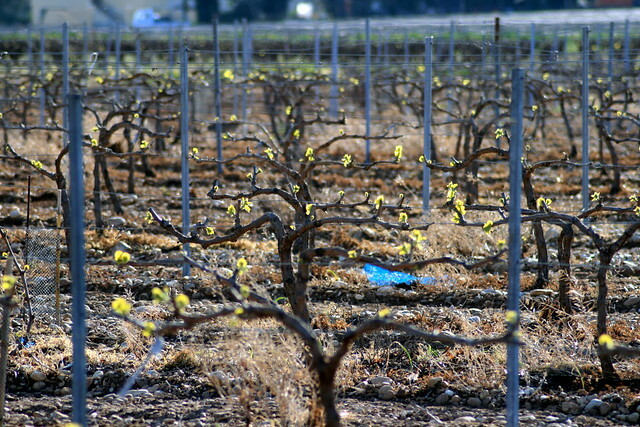 Parallels are often drawn between viticulture and enology with cacao cultivation and chocolate-making, but the comparisons are only analogous to a certain point. There is a physical and figurative divide “between tree and mouth” that obstructs the expression of terroir in chocolate (Leissle 22). As cacao travels thousands of miles from tropical growing zones to factories in Europe and North America, the ability to reflect cacao’s origin in the final chocolate product becomes increasingly difficult (Nesto 132; Leissle 22). The place of manufacture often subsumes the place of bean origin (Leissle 23). Closer proximity between cultivation and manufacturing, in addition to fewer transfers of ownership, would begin to narrow this gap (Nesto 132). With more control throughout the entire cacao-to-chocolate chain, terroir—or the “sense of place” of chocolate—can be better preserved (Nesto 135). Chocolate reflecting its cacao bean origins is a relatively new topic of collective interest. Historically, chocolatiers believed blending beans from many different places yielded a more desirable chocolate. In addition, in the past, consumers did not express interest in origin-labeled chocolate. “Single-origin” chocolates began to appear in the U.S. market in 1984 during the growing food movement of eating local and learning about food provenance (Leissle 23; Netso 134). To illustrate the nascent bean-to-bar craft: in 1997, there was only one artisanal chocolate maker selling commercial bean-to-bar chocolate in the U.S. (Leissle 23). Today, twenty years later, there are nearly 200 chocolate makers in this category, demonstrating a continued growing interest in where the beans in chocolate come from (Wiley 2017). “Single-origin” is the name applied to chocolate made solely with beans from a particular plantation, area, or country (Leissle 23). Other terms include “exclusive-derivation,” “single variety,” “grand cru,” and “estate grown” (Presilla 126; Leissle 23). To the experienced taster, the advantage of a single-origin chocolate is that all the subtleties of its terroir will be distinct. Yet, it is important to note that, single-variety chocolate does not necessarily mean higher quality. No matter the origin, if the beans are of poor quality, the chocolate will be too (Presilla 128). In contrast to single-origin bars is chocolate made with blends of cacao beans of different types or from different geographical areas. While blending is often associated with anonymous chocolate of corporate mass-producers, the craft of blending is pre-Columbian and does not necessarily have to be “anonymous” or of low quality (Presilla 126). Both single-origin and blended cacao beans are legitimate approaches to chocolate-making—neither method is necessarily better than the other. Yet, across both chocolate-making processes, there is a dearth of labeling of the cacao’s origins—whether a single area or multiple (Presilla 128). Cacao beans vary by strain–such as Criollo, Forastero, or Trinitario–or geographic area. A chocolate tasting seemed like an apt opportunity to further explore terroir and bean origins in chocolate. The chocolate availability at Cardullo’s Gourmet Shoppe in Harvard Square, a purveyor of specialty foods, had the most impact on the final sample selections. There were not enough bars produced in the same area as the bean origin to conduct a tasting. In addition, the store only displayed one chocolate bar made with West African cacao beans and was out of stock at the time of purchase. The majority of the world’s cacao supply comes from West Africa, but the average consumer would not realize this simply by surveying the chocolate bars on the store shelves. The limited availability of West African sourced chocolate appears to reflect larger trends of exclusion in trade logistics, purchasing power, bean type, and politics (Leissle 23). In the end, the tasting was organized around four chocolate bars with different origins and, hopefully, terroirs. The selection began with three dark chocolate bars made with single-origin beans from three different places, with similar cacao content and minimal added ingredients. The last chocolate was a milk chocolate bar made from blended cacao beans, for the purpose of comparing cocoa content, texture, and taste. Participating tasters conducted a sensory evaluation, consumed the chocolate, and ranked the overall appeal on a numerical scale. The first sample—labeled “Chocolate A” —was Chocolat Bonnat’s Madagascar bar. While the packaging boasts that the beans are from a carefully selected cocoa grands crus in Madagascar, the chocolate itself is produced in France. The bar is 75% cacao and the listed ingredients in order are cocoa beans, cocoa butter, and sugar. This bar was selected as the first sample because its flavor profile promises “blond cocoa and sweet Indian Ocean, fruity, well balanced.” The aim was to begin with a chocolate bar that was not too overpowering in terms of flavor and texture. This bar held true to its promise of balance. The tasters’ observations were not particularly specific, simply noticing that the taste was both sweet and bitter. The average ranking for the chocolate was 3.92 and was the crowd favorite for its evenness. Participants noted that there was nothing too strong about it, either in aroma or taste, and therefore, they would be more likely to consume the whole bar or buy it again. Goodnow Farms Chocolate’s Esmeraldas was selected for the second sample, “Chocolate B.” This “premium dark chocolate” bar highlights that the cacao beans are “single origin” from the Salazar family farm in Ecuador’s Esmeraldas region. The chocolate is part of a “small batch” production process in Sudbury, Massachusetts, with this particular bar from batch number 1,046. The bar is 70% cacao and the listed ingredients in order are cacao beans, organic sugar, and cocoa butter. The packaging describes the flavors within as “intense,” “berry jam,” and a “long, pleasantly tannic finish.” This bar was selected to be tasted second in the sequence because of its promise of bold, fruity flavors. Even though the bar does not contain fruit additives, the “berry jam” description seemed very apt when tasters commented on the chocolate’s color and taste. The color of the chocolate was described as so dark that it had a purple or even black hue. The flavor was described as “fruity” with elements of coffee or a stout beer. These specific descriptors immediately set the reactions apart from the first bar even though the listed ingredients are the same and the cacao content is even slightly less. While my hypothesis was that the difference was due to terroir—the combination of genetics, location, and human intervention—the tasters were more convinced that it was the manufacturing process alone, such as how long the cacao beans were roasted, that accounted for the taste differences. The average ranking was 3.85, but with more varying opinions than the previous sample. The third sample, “Chocolate C,” was Taza Chocolate’s 80% Dark Dominican Republic. This bar is part of Taza Chocolate’s “Origin Bar” series where the packaging advertises that the chocolate is “made from bean to bar” in Somerville, Massachusetts. The ingredients are all labeled as organic—cacao beans, cane sugar, and cocoa butter—except for the vanilla beans. This bar was selected for its texture; the stone ground technique would provide a comparison for mouthfeel for the tasters when compared to the other chocolate bars. While the chocolate wrapping does not describe the flavor profile beyond its boldness, the online description describes the tasting experience as starting “with a burst of ripe strawberry fruit, then mellows into coffee and smoky notes” (Taza Chocolate). This chocolate bar was third in the sequence and last for the dark chocolate selections because it contained both the highest cacao content and the most powerful flavors. This sample elicited the strongest reactions from the group and received the lowest average rating of 1.93. Those who had never tasted stone ground chocolate were surprised and unreceptive to the gritty, “sandy” texture. For those who were familiar with Taza Chocolate and did not mind the texture, commented on the strong flavor, describing it as “blueberry,” “cherry,” and “chipotle, without the spice.” The robust flavors and descriptions may be attributed to the use of vanilla beans in the chocolate, which is typically used to intensify and highlight other present flavors in chocolate (Presilla 138). Chocolove’s Milk Chocolate bar, containing 33% cocoa, was the last sample: “Chocolate D.” This sample was last, for it had the most additives—cocoa butter, milk, cocoa liquor, soy lecithin, and vanilla—and was predicted to be the sweetest tasting. Instead of a single cacao bean origin, this bar is made from “a blend of Javanese and African cocoa beans” with “caramel-like flavors.” Rather than drawing on the lexicon associated with origins and traditional chocolate-making techniques, Chocolove references luxury and a historical tradition by mentioning that this bar is “Belgian milk chocolate” in several places on the front and back of the packaging. Like the other chocolate bars, this bar is not made in the place of origin, but in Boulder, Colorado. Every single taster described this sample as “sweet” and some further elaborated with descriptions of “caramel,” “vanilla,” and “creamy.” A few tasters referenced a sentiment of artifice or a lack of perceived chocolate authenticity, mentioning the flavor tasted “cheap,” “fake,” “processed,” or like it was made with “condensed milk.” These reactions are appropriate when scanning this chocolate bar’s ingredients: sugar is listed first. Despite the consensus that the chocolate bar was overly sweet, the chocolate was still perceived as relatively favorable with an average rating of 3.36. While all the tasters are self-professed dark chocolate lovers, they shared that the saccharine taste of the Chocolove would appeal to them for the times when they do want a milk chocolate bar. The addition of sugar appeared to overpower any display of terroir and the discussion gravitated towards texture. As a group, we discussed whether we are socially conditioned to perceive “smooth” chocolate as “good” chocolate. So, even though the milk chocolate flavor was not necessarily better than the that of the Taza Stone Ground chocolate, this sample was more well-received because of its silky texture. The packaging of the chocolate samples were revealed at the end to facilitate a discussion about tasting terroir. Overall, the chocolate tasting was an insightful experience into terroir and bean origins of chocolate. All the tasters agreed that they could taste distinct differences between all the chocolate samples. While the group thought that some of the differences could be attributed to the place origin and plant genetics, they ultimately believed that human intervention was the largest influence on the final chocolate taste. With so many factors to consider when choosing the samples of chocolate, it would be interesting to host another tasting with the same group of people but with different selection criteria. For instance, many chocolatiers argue against the use of percentages in chocolate advertising, saying that high cacao content does not necessarily reflect good flavor (Williams and Eber 170). A future tasting could test chocolates of different cacao content, but all from the same origin. Terroir is a quality in a food product that synthesizes genetics, location, and human interactions to evoke a “sense of place.” The participants in the chocolate tasting believed that human intervention was the most dominant factor in affecting how terroir is perceived in the final product. To investigate terroir in chocolate is to inquire into a chocolate bar’s origins. Regardless of a single origin or multiple origins, labeling a chocolate bar’s beginnings invites curiosity about its origins and what makes its taste distinct. Doing so paves the way for more socially responsible chocolate. For instance, an excellent chocolate bar labeled with its origins from a less-publicized chocolate-producing regions, such as those in West Africa, could be a positive representation (Leissle 30). As consumers become more interested in where their chocolate comes from, chocolate makers gain incentive to move closer to the cultivation process (Nesto 135). Combined with further research into different bean strains and place distinctions, there is much to look forward to the future of terroir in chocolate. Martin, Carla D. “Health, nutrition, and the politics of food & Psychology, terroir, and taste.” 11 April 2018. AAAS 119x, Harvard University. Nesto, Bill. “Discovering terroir in the world of chocolate.” Gastronomica 10, no. 1 (2010): 131-135. Presilla, Maricel. 2009. The New Taste of Chocolate: A Cultural and Natural History of Cacao with Recipes. Stuckey, Barb. 2012. Taste: What You’re Missing. pp. 132-156. Wiley, Carol. 2017. 198 U.S. Bean-to-Bar Chocolate Makers: A State-by-State Guide. Upon learning of his troops’ devastating losses in the French colony of Saint-Domingue, soon to be Emperor of France, Napoleon Bonaparte, is said to have proclaimed “Damn sugar! Damn coffee! Damn colonies!” Two years later in 1804, the colony would proudly proclaim its independence as Haiti, and Napoleon would soon after part with most French holdings in the Western Hemisphere (Baptist, Edward E). While the Haitian revolution would wipe out coffee production on the island and contribute to a “sharp decrease” (Mintz, 69) in global sugar production, there was another casualty not included in Napoleon’s famous epithet: cacao. The first commercial cacao plantation of the Spanish empire was established by Hernando Cortez in present day Haiti during the early 1500’s (“Chocolate History”). While this early attempt did not turn out favorably for Spain, it did not stifle other attempts to increase cacao production on the island. The period spanning the early 17th century through the early 19th century “saw the institution…of large scale cocoa production” in which “Haiti’s cocoa production dwarfed that of Venezuela, being nearly ten times as large” (a Brief History of Chocolate) However, following the Haitian revolution, there was a distinct move away from the plantation system as former slaves strongly tied independence to land ownership. When the country divided briefly into the northern kingdom and the southern republic, a plantation system was maintained in the north while small plots of land were distributed to those in the south. Unsurprisingly, the population preferred the “free and poor” life of the latter over the “happy against their will” (Girard, p.67) existence often used to describe northerners. Once the North fell following Christophe’s suicide by silver bullet, Jean-Pierre Boyer reunited the country and instituted the smallholder farmer system nationwide. However, the propagation of small landholder model meant a precipitous decline in production. Post-harvest loss estimated to be between 20-25%, due to “poorly kept ageing plantations that are usually in just one hectare of land and managed by ageing farmers” (confectionerynews.com) Many youth in Haiti, not seeing a future in agriculture, migrate to urban centers for education and work opportunities. Haitian cacao being sold unfermented due to poor infrastructure for drying which often leads to mold growth during the rainy periods (confectionerynews.com). Lack of awareness of Haiti as a origin for fine cacao, particularly among American consumers (“Haitian Chocolate Project.”) While the Dominican Republic is a fairly well-known origin country, and services both the US and Latin American markets, many consumers are unaware that the countries share an island and that Haiti has comparable cacao. However in recent years there have been a number of initiatives to revitalize the Haitian cacao industry. Premium chocolate companies such as Taza (“Haiti Trip!”), Equitable, Singing Rooster, and Askanya have worked to both source Haitian cacao as well as create sustainable bean-to-bar production companies within the country. Because of their efforts, Haitian chocolate can now be purchased at Whole Foods, and other fine retailers in the United States, France, and Belgium. Products include Taza’s 84% Dark Haiti Chocolate Bar (“84% Dark Haiti.”) and Singing Rooster’s Lemon Ginger Chocolate Bar (“Haitian Chocolate (and Raw Cacao for Bean to Bar Makers)”). Haitian cacao has also been used in beauty products, with Haitian-owned companies such as Kreyol Essence (“Haitian Black Castor Oil”) producing Haitian Organic Chocolate Black Castor Oil, also sold at Whole Foods. Furthermore, noting that cacao accounts for 30 percent of the country’s primary exports, the Ministry of Agriculture (MARNDR), along with donors such as the IDB, USDA, and USAID, have worked to improve infrastructure, farmer/cooperative capacity and access to markets. In 2011, FECCANO, became the first Haitian cooperative to export fermented cocoa, which was also certified fair and organic. In November 2013, Haiti’s cocoa was voted the best in the world, according to the International Cocoa Awards (“Le Cacao D’Haïti”). Thus while the challenges are plentiful there exists a strong possibility to build up the cacao industry in Haiti and create livelihoods for tens of thousands of families on the island. While some components are structural and must be addressed by the government and donors, consumers can as well support Haitian cacao by purchasing specialty bars and spreading the word about the emerging market. Haiti also serves as a microcosm for the nuanced history cacao has throughout the Americas, showing how a product that was initially associated with slavery and forced labor can, with a concerted effort, be transformed into a product that provides freedom for it’s growers in the form of new opportunities for education, healthcare, and property-an example of just some of the items cacao livelihoods can provide. The responsibility now is for everyone in the supply chain to practice responsible production and consumption to assure that cacao continues to be a plant of opportunity and joy. a Brief History of Chocolate, http://www.hhhh.org/cloister/chocolate/history.html. Doing Business in Haiti – World Bank Group, http://www.doingbusiness.org/data/exploreeconomies/haiti. Building a Stronger Haiti with Chocolate | University of Michigan News, ns.umich.edu/new/multimedia/videos/24582-building-a-stronger-haiti-with-chocolate. “84% Dark Haiti.” Taza Chocolate, http://www.tazachocolate.com/products/84-dark-haiti. Baptist, Edward E. “The Ironic, Tragic History of the Louisiana Purchase That Your Teacher Never Told You.” Slate Magazine, 6 Aug. 2015, http://www.slate.com/articles/life/history/2015/08/the_most_successful_slave_rebellion_in_history_created_an_independent_haiti.html. “Category:Haitian Revolution.” Category:Haitian Revolution – Wikimedia Commons, commons.wikimedia.org/wiki/Category:Haitian_Revolution. “Haiti Trip! Taza Is the First American Chocolate Company to Source Organic Haitian Cacao.” Taza Chocolate, http://www.tazachocolate.com/blogs/news/67713347-haiti-trip-taza-is-the-first-american-chocolate-company-to-source-organic-haitian-cacao. “Haitian Black Castor Oil Organic Chocolate 100% Natural 3.4oz.” Kreyòl Essence, kreyolessence.com/products/haitian-black-castor-oil-chocolate-arome-chokola. “Haitian Chocolate (and Raw Cacao for Bean to Bar Makers).” Direct Trade Haitian Coffee, Art, Chocolate, 3 Feb. 2017, singingrooster.org/haitian-chocolate-and-raw-cacao-for-candy-makers/. “Haitian Chocolate Project.” Yellow Seed, http://www.yellow-seed.org/origins/haitian-chocolate-project. “How Askanya Is Reviving Haiti’s Chocolate Industry.” Kreyolicious.com, 8 Sept. 2016, kreyolicious.com/askanya-haitian-chocolate-industry/24851. “Le Cacao D’Haïti : Entre Filière Porteuse Et Absence De Politiques Publiques.” Quotidien Le National, 2 Mar. 2016, http://www.lenational.org/cacao-dhaiti-entre-filiere-porteuse-absence-de-politiques-publique/. Mintz, Sidney W. Sweetness and Power: the Place of Sugar in Modern History. Penguin, 1985.
confectionerynews.com. “After the Earthquake: Haitian Cocoa Rep Rises on High-End Chocolate Scene.” Confectionerynews.com, 17 Feb. 2015, http://www.confectionerynews.com/Article/2015/02/17/Haitian-cocoa-a-rising-origin-for-premium-chocolate. The chocolate industry has been fraught with ethical dilemmas since the beginning of its existence. From imperialism where Europeans co-opted the traditions of Mesoamericans to the reliance on slavery for cacao production chocolate producers have engaged in problematic and exploitive practices in order to build their companies and brands. As present-day American and Europeans become more aware of this troubled past and still troubled present, they are demanding more from chocolate brands. 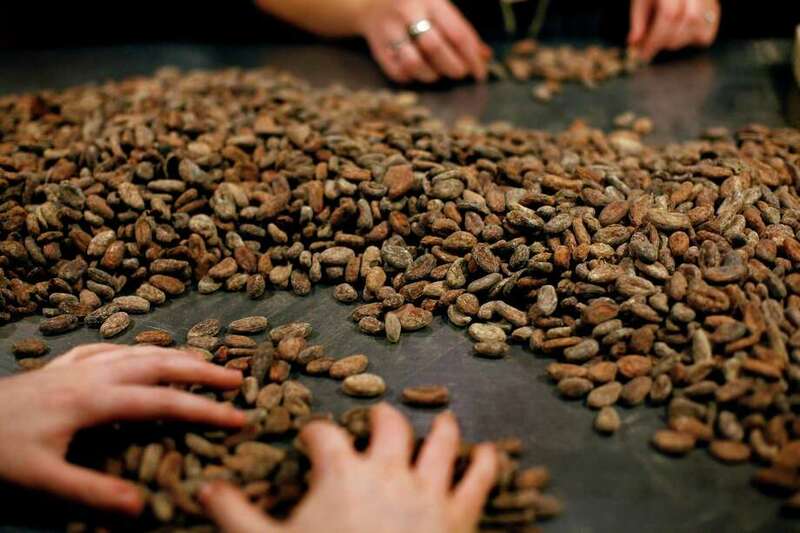 This has manifested itself most commonly in the form of fair trade certification but it has also taken the form of chocolate producers trying to connect their brands to what they perceive as the authentic origins of their cacao beans. Through packaging and advertisements, chocolate producers try to convince their consumers that they care about the West African cacao farmers and Mesoamerican cultural origins of cacao that are responsible for the products they sell today. However, their efforts are often misguided, insufficient and sometimes even harmful. One such example is a set of Divine Chocolate advertisements featuring the Ghanaian farmers that grow and harvest their cacao. Divine Chocolate is a London-based fair trade chocolate company that is co-owned by Ghanaian farmers like those featured in the ads (Leissle 137, 123). Their advertisements attempt to convey this fact while combating negative stereotypes of Ghana, and Africa more generally. Scholar Kristy Leissle believes they achieve this goal, but, in reality, the representation of the cacao farmers is mostly superficial and still ultimately exists to cater to a Western audience. Another example is Taza chocolate, a Somerville based chocolate manufacturer, that sells stoneground chocolate inspired by the founder’s trip to Mexico (“Our Founders – Taza Chocolate”). Taza chocolate is an example of a chocolate producer that tries to tie itself to the origins of cacao in Mexico as a part of its branding and marketing strategy. However, the result is just another chocolate company that has appropriated Mexican culture for its own benefit without paying real and meaningful reparations to the communities it takes from. I will be discussing the effectiveness of Divine and Taza in truly providing representation and compensation to Ghanaian cacao farmers and Mexican chocolate makers, respectively, for their, often involuntary, contributions to the chocolate companies. Each advertisement in this series features a Ghanaian farmer in a westernized version of African dress standing in front of “images of Ghana’s agricultural economy: cocoa drying tables, plantain trees, coconut trees, mud buildings, and dusty roads” (Leissle 128). The women pose with one hand on their hip, the other holding a piece of chocolate and finally a caption including the name of the farmer along with the claim that they are a co-owner of Divine. Additionally, each advertisement has a tag line. In the ones pictured it says “Equality Treat” and “Decadently Decent” while others say “Serious Chocolate Appeal” (Leissle 124-126, 128). By photographing the farmers in Ghana in what appears to be African dress, Divine is implying that they are presenting an authentic representation of the lifestyles of the Ghanaian farmers. Divine also paints themselves as more ethical with the use of the tag lines as well as the declaration that these farmers own part of the company. While these photographs may appear authentic to naïve Western eyes, they are not accurate reflections of the lives of these farmers. Kristy Leissle observes that “Despite its ‘African’ appearance to viewers outside the continent, these textiles and dress styles are historically hybrid designs” (Leissle 129). Divine Chocolate presumably tried to imitate traditional Ghanaian dress when they dressed the farmers for these advertisements. However, the women are wearing “Dutch wax print cloth” and not traditional Ghanaian dress (Leissle 136). In fact, the clothes were provided by Divine and St. Luke’s, an advertising agency in London (Leissles 124). Both of these companies are based in London, so achieving traditional Ghanaian dress would be nearly impossible without incorporating the input of either the farmers themselves or other Ghanaians, which is not what Divine did. Leissle suggests that this lack of authenticity is acceptable because “their clothing and fashion suggest that they are cosmopolitan participants of this exchange” (Leissle 128). Leissle seems to think that Divine might not be aiming for authenticity but instead for representing the farmers as worldly and engaged in the chocolate production industry. This theory is supported by the fact that their farmers are co-owners of the company. However, this is a midguided goal if Divine is trying to be an ethical company. This viewpoint still privileges Western society rather than sincerely helping and uplifting cacao farmers. By portraying this cosmopolitan factor as admirable and desirable, Divine is suggesting that Ghanaian farmers find ultimate value in being a part of the European economy of chocolate production and not in other ways like the Ghanaian economy. By representing these Ghanaian women as glamorous business owners, the images invite viewers to see them as potent actors in transnational exchanges of cocoa and chocolate, and as beneficiaries of these exchanges, in contrast to analyses that focus on market exploitation by the nation state or corporate actors. The images pose a challenge to narratives that cast Africa as continually on the losing side of harmful binaries – primitive/civilized, traditional/modern – and in an eternal developmental lag. Instead, they offer an alluring female figure that envisions and promotes Africa’s roles in industrial production and luxury consumption (121). Divine is using images of black people, as Pieterse observes, and shows the Ghanaian farms as producers “with the appearance of potential development” as Ramamurthy observes. Even more disturbing is the fact that Ramamurthy observed this in a response to support for imperialistic policies in Africa, which shows a connection between that imagery and the exploitation of Africans. Furthermore, all of this is on the assumption that as co-owners, the farmers are getting a fair compensation and that they have access to the chocolate they help produce. However, as Emma Roberston reveals, “Such romanticized narratives of chocolate may be pleasurable to those lucky enough to be able to consume them. However, they are largely divorced from the material conditions of production” (Robertson 2). Even though Divine does a very good job of making us believe their Ghanaian farmers have this, ultimately the ads are made for the European consumer Divine is selling to, so they will make it look as good as possible. Finally, Divine played into stereotypes of black people in the way they asked the farmers to pose. According to Leissle, the theme of the photoshoot was “‘women with attitude’” (124). Black women specifically are thought to have attitude problems and as a result are often described as disrespectful, rude and sassy. In fact, Leissle describes the farmers as having a “sassy assertion of confidence” in their poses (134). While the way she describes the poses puts them in a positive light, the added context that these are Black women that have been asked to pose “with attitude” and “sass” reveals that Divine still probably sees the women in a stereotypical light. In the light of recent marketing campaigns for luxury fairtrade chocolate such as ‘Mayan Gold’, it is important to recognise the ways in which ethical consumption today may smooth over the inequalities of the imperial past, and bypass an awareness of the processes of industrial manufacture, by drawing on ancient, mystical and exotic imaginings of the origins of cocoa (5). As a chocolate manufacturer, Taza chocolate has tried to emulate the Mexican process of chocolate production and was founded because the founder wanted to bring stone ground chocolate, which he discovered on a trip to Mexico, to America (Taza website). To truly accomplish this ethically, he needs to not only be authentic in order to live up to the claims of Mexican-inspired chocolate but also needs to give back to the community that he is borrowing and profiting off of, with special attention to the history of imperialism. argue[s] that the accomplishment of Mexican authenticity, whether maintained by Mexican owners or performed by large restaurant chains, is a social construction. However, despite its socially created qualities, performances of authenticity and ethnicity affect not only how individuals understand each other, but illustrate the challenges faced by different groups of people in the commercial production and consumption of identity (315). She argues that this is the case because companies attempting to achieve Mexican authenticity submit to the will of the consumer, which inhibits their ability to be able to be authentic. She studies Mexican restaurants primarily owned and operated by Mexican immigrants or first generation Mexican-Americans who would presumably be both the most authentic and most passionate about sticking true to that authenticity. She expands on this later in her essay when she says “While they are able to display personal values associated with their presentation of ethnic heritage, they must also make concessions to fulfill certain customer expectations…Customers desired the ‘illusion of authenticity’ regardless of modifications pertaining to the use of spices, methods of preparation, and styles of service” (326). If those with Mexican heritage are unable to truly achieve and maintain authenticity, then it seems nearly impossible for Taza Chocolate, with a White American founder with no claim to Mexican heritage, to be authentic to Mexican chocolate production. However, the founder Alex Whitmore, did an apprenticeship in Mexico to learn how chocolate was produced so that he could reproduce it in America and their chocolate production process is captured in a video on their website (“About Taza – Taza Chocolate”). (“About Taza – Taza Chocolate”). The next video is chocolate being made in Mexico by Chocolate Mayordomo De Oaxaca, a Mexican chocolate company. There are a lot of similarities between the videos, which suggests that Taza has made a significant effort to stay true to the authentic Mexican chocolate production process. Taza does not appropriately give back to the communities it is profiting off of. It claims to source its beans ethically and pay fair wages to the farmers, but that will not truly change the lives in the way that Whitmore’s co-opting of their culture is changing his life. In order to do that, he could move manufacturing to Mexico itself and import into Massachusetts. That would truly give Mexico its fair share of the profit, especially given the history of imperialism that has allowed Whitmore to profit off of someone else’s culture. With a rise in conscious consumers, the fairly infamous chocolate industry has seen an expansion in advertisements and packaging geared towards the ethical consumer. Unfortunately, many of these efforts do not accomplish what the companies intend. The companies still prioritize the Western consumer over the Ghanaian and Mexican producers, in the case of Divine and Taza chocolate, which continues to skew the power structure and equality. However, these companies sell themselves as ethical while profiting off of the producers in unequal and unfair ways much like those they claim to denounce. It takes a radical reversal of power given the history of imperialism and slavery for these companies to truly represent and uplift the communities they are profiting off of and claiming to help. Mexican Restaurant Industry.” Journal of Contemporary Ethnography, vol. 37, no. 3, June 2008, 314-341.
advertisements.” Journal of African Cultural Studies, vol. 24, no. 2, December 2012, 121-139. Today niche markets blossom as the national food system increases efficiency and homogeneity. These two interconnected trends force us to ask ethical questions that our grandparents never faced. Firstly, technology both mechanical and genetic, have spurred unprecedented efficiency in food production. We see record yields per acre in corn and soybeans every year (Kristy). Discussions about the risks of GMOs aside, most would agree that today’s feast is preferable to the famines our ancestors faced only a few generations ago. As the most privileged consumers in history, we take for granted the concerns of our forefathers; namely, access to safe, nutritious, food at a reasonable cost. Today food is more accessible, cheaper, and safer than any other time in history (Laudan). This is all good news for consumers. As food choices have become unanimously safe and inexpensive, little was left to differentiate one brand from another. As consumers we are currently experiencing the, “process generation.” Beginning around the time of the organics movement in the late 1990s, process has come to dominate marketing and consumption. Companies all had complete access to the same limitless basket of ingredients, and were producing only marginally different products. Process became king. When choosing the type of pasta, one no longer looked at the nutrition facts, knowing they would all be roughly the same. Rather, one looked for branding that might denote the most ethically, or sustainably produced pasta made by the most charitable and socially conscious company, packaged in the least wasteful and most recycled paper. Food no longer had to be safe and nutritious, those aspects were assumed, food needed a story. Thankfully food producers were quick to answer the call. The dichotomy of processed versus non-processed has become complicated by the addition of ethical process issues. Shoppers suddenly can choose between Kraft mac-n-cheese and Annie’s organic and all natural mac-n-cheese, never mind both products are made by multinationals. It does not matter what the story is, but if you are a conscious consumer your food needs a story. Morality suddenly sits on the dinner plate, every food option is either, right or wrong, typically buying the, “right” food costs a little more. Your eggs need to be cage free, your fish needs to be caged, your coffee needs to be fair trade, and your beer needs to be a local brew. The birth of the process generation means that food makers can choose one of many social issues to attract customers. Those customers in turn, use their food purchases to signal their values to their communities. Though people have always used food to signal wealth, for the first time in history, your salad dressing can prove to your neighbors what a charitable person you are. Of course the vast majority of the food industry has remained unchanged, but among premium products differentiation comes with a back-story. Though a little slower to the table, the chocolate industry is no different. Food advocates often refer to consumption decisions as casting a vote. When walking down the chocolate aisle at the grocery store, you can vote for a wide range of social causes. Your chocolate can help save endangered species, fight global warming, empower women, build schools, pay farmers livable wages and stop deforestation. A relatively new niche has developed in the chocolate industry. Bean to bar chocolate makers occupy a tiny portion of the total chocolate industry but claim to impact producer communities while delivering superior chocolate. Bean to bar chocolate makers are the latest iteration of food snobs, combining the artisanal specificity of a craft brewer with the social awareness of a fair trade coffee roaster and the geographic condescension of a wine connoisseur. If your purchase is your vote, we need to understand who’s on the ballot and what exactly it is that they stand for. This post will try to figure out if bean to bar chocolate makers actually reduce inequality in the chocolate industry or if they simply provide the latest luxury for affluent consumers: peace of mind. Chocolate bars are typically plastered with certifications to prove their ethical engagement. Gluten free, GMO free, organic, and fair trade are all common badges. However bean to bar makers often go beyond these more standard certifications and claim to address problems that more mainstream bars only hint at. Namely bean to bar chocolate makers try to address the issue of inequality in the chocolate industry. Activists often accuse large chocolate makers of selling “blood” chocolate, or chocolate made from cacao produced by exploited people (Ryan). The common narrative paints cacao farmers as impoverished surfs, exploited by the fickle winds of a corrupt commodity market. However, those same farmers are often accused of exploiting children, by forcing them to work in their cacao plantations as slave labor. More than 500,000 children are estimated to be trapped in forced labor between Ghana and Cote D’ivoire, an area that produces roughly 75% of the worlds cacao (Mustapha). For this reason many consumers flock to chocolate certified as fair trade, searching for assurance that their favorite chocolate company pays farmers enough to avoid forcing children to work as forced laborers. Taza chocolate based in Somerville Massachusetts is often cited as a shining example of social responsibility in the chocolate world. Self described, “chocolate pioneers” Taza created their own certification, “Direct Trade” that supposedly holds producers to higher environmental and fair-labor standers than the current “Fair Trade” certification. Taza is not simply blowing smoke. They seem genuinely committed to their standard, going so far as to employ, “Quality Certification Services” a third party auditor accredited by the USDA, to audit their internal supply standards. To go even further Taza publishes a yearly transparency report that illuminates the amount and price paid for cacao from each producer region. Currently Taza partners with five grower communities in Bolivia, Belize, Dominican Republic, and Haiti. The below video describes how Taza has impacted their farmer partners in Haiti and generally how the Direct Trade model is supposed to work. Though not explicitly stated, the video shows how Direct Trade relies on a framework of intermediaries to organize high quality cacao production. Though Taza found quality cacao in Haiti, investment and technical support were required for industrial production. Pisa is a cacao company that buys raw cacao seeds from farmers and prepares and markets them for export. In addition to coordinating with buyers such as Taza, Pisa supports farmers, helping them grow the most efficient and highest quality cacao possible. The video only briefly referenced Root Capital. This Cambridge based company works to, “connect smallholder farmers to world markets” typically through financing, technical training and business education (Root). Though called, “Direct Trade” Taza’s video shows that farmer – chocolate maker interactions are complicated, and even in their simplest forms require third and fourth party involvement. As ethical consumers, we can celebrate the impact that Taza and their partners have had in Haiti. The Direct Trade model appears to help stabilize demand and provide consistent, fair pricing for farmers. In his book “The Fair Trade Scandal” Ndongo Samba Sylla explains how price fluctuation and market inconsistency are two of the main factors preventing farmers from investing in their farms. His point, as the title might suggest, is that the “Fair Trade” standard falls short of reducing inequality in the chocolate industry. Adding a few hundred dollars to an ever changing global cacao price is often not worth the high certification fees for farmers (Sylla). Taza appears aware of the shortcomings of “Fair Trade” and seems determined to overcome the challenge of inequality. However, is there a point at which too much foreign involvement can hurt a cacao community? Taza founder Alex Witmore explains about his role as co-founder of “Maya Mountain Cacao” in Belize. Maya Mountain acts much like Pisa did in Haiti, providing industry coordination as well as technical support for new and existing farmers. A cynic might see Taza’s investment in the Belizean company as a step backward toward colonial sugar or cacao production, once so common in Sough America and the Caribbean. However, while some socially conscious consumers might still cringe, Taza appears to be fostering an infant industry in Belize. Firstly, according to Taza’s transparency report, they only bought 3.81 metric tons of cacao from Maya Mountain in 2016. This purchase made up approximately 1.6% of all Taza’s total purchases by weight. Secondly 74.5% of the sale price went to Maya Mountain’s partner farmers, this is on par with, or slightly higher than the percentages paid to farmers in Taza’s other four production groups. At this point it appears that Taza is leveraging their considerable industry knowledge to support cacao cultivation in an infant cacao industry. After going through the literature and the information on Taza’s website, it seems like they are the gold standard for a reason. Taza strives to create legitimate impact in their producer communities. We can’t fault Taza for their limited impact simply because they are a comparatively small company. As a second case study we examine Lake Champlain Chocolates, a confectioner based in Burlington Vermont. From the start LCC and Taza appear to be from two different generations. Taza embodies the ideals and desires of the “process generation” prominently sporting the option, “learn” next to the, “buy” or, visit buttons on their homepage. This header sits over a slideshow of chocolate close-ups, machinery grinding beans and farmers growing cacao. The website expertly communicates that Taza values process as much as any millennial. LCC on the other hand, is a retail website. The homepage sports glossy images of neatly packaged seasonal gifts. Customers have to scroll to the bottom of the page and hunt through the fine print to find the “About Us” section. While this product-oriented approach to marketing denotes humility on LCC’s part, it misses the importance that current consumers place on a food’s background. On the face of it LCC is appears to be from the generation where luxury meant flavor and packaging, not a social conscience. However beneath the superficiality of websites, LCC and Taza may have much in common. Blue Bandana Chocolate Maker is one of LCC’s sub-brands. Blue Bandana is a bean to bar chocolate maker, currently producing five, single origin bars. Started in 2012 by LCC’s, now CEO, Eric Lampman Blue Bandana partners with growers and cooperatives to provide consistent income while ensuring the highest quality cacao. One of the ways that Blue Bandana ensures that their partner-farmers are upholding high labor and environmental standards is through site visits. The below video shows follows funder Eric Lampman as he pays a visit to Anselmo Luc, a Guatemalan cacao producer. I had the good fortune to speak with Nick Hadsel-Mares, the principle chocolate maker at Blue Bandana about the company and the bean to bar industry more generally. Nick explained that Blue Bandana, and many other bean to bar makers are riding a wave of consumer demand. According to Nick, “Chocolate is a completely different landscape than it was ten years ago.” He added that, “Consumers have shifted, they expect a lot more transparency, they want Fair Trade and organic and are willing to pay a premium for it.” The new tide of consumer interest in transparency is one that Nick thinks is unlikely to end. When asked what drove Blue Bandana to work with a specific community he said, “Well firstly, it’s all about the beans, we’re a company after all and we need to produce exceptional chocolate bars. That being said, we care deeply about the working conditions and practices on our partner’s farms. If a producer is not transparent about their practices, we won’t work with them.” According to Nick, Blue Bandana’s commitments to ethical process and Direct Trade are not unique in the bean to bar community. From his years in the industry, Nick assured me of the earnestness and responsibility that bean to bar makers feel about their partners growing the cacao. Because Blue Bandana is much smaller than Taza, they don’t have the resources to produce an in-depth transparency report. However Nick assured me that part of their direct trade model is paying farmers well above the “Fair Trade” price for premium cacao. After researching both companies and speaking to Nick, it appears this post is premised on a false dichotomy. Bean to bar chocolate makers might simultaneously impact their producer communities while also providing a product inline with consumers’ ethical standards. Because the bean to bar industry makes up an estimated .47% of the chocolate industry, their impact might go further than critics expect. Consumers are demanding more transparency and more ethical process. Though small, companies like Taza and Blue Bandana are validating that consumer interest. Some, including Nick, hope that Taza and Blue Bandana can teach the rest of the chocolate industry how to be “better” while still turning a profit. When evaluating these companies as consumers it is important to remember one thing; Blue Bandana and Taza never ask consumers to compromise on taste. Both companies are jointly driven by finding powerful and unique flavors while achieving a tangible benefit for their places of origin. Ethics aside, many would argue that the premium for these bars is justified by taste alone. However, knowing that farmers are paid a fair price only makes the bar that much sweeter. Special thanks to Nick Hadsel-Mares who took time out of his busy schedule to chat. His skill as a chocolate maker is paralleled only by vast knowledge of the industry. Kristy Foster Seachrist | Sep 09, 2016. “Georgia producer sets new world soybean yield record.” Corn and Soybean Digest. N.p., 21 Sept. 2016. Web. 05 May 2017. Laudan, Rachel. “Plea for Culinary Modernism.pdf.” : n. pag. Print. Mustapha, Kemi. “Taste of Child Labor Not so Sweet: A Crititue of Regulatory Approaches to Combating Child Labor Abuses by the U.S Chocolate Industry.” 1 (2010): n. pag. Print. “Root Capital.” Root Capital. N.p., 03 May 2017. Web. 05 May 2017. Ryan, Orla. Chocolate Nations: Living and Dying for Cocoa in West Africa. N.p., 2011. Print. Sylla, Samba Ndongo. The Fair Trade Scandal. N.p., 2014. Print. Harsh working conditions of sugar cane harvesters and child- and slave-labor involved in harvesting cacao pods stand in stark contrast to the delicious enjoyment of chocolate in our Western societies. To rectify this juxtaposition, B corporations have the built-in mission to benefit society by meeting rigorous standards of social and environmental performance, accountability, and transparency (BCorp, n.d.). The chocolate industry, an industry particularly riddled with ethical dilemmas, is only represented by five certified B Corps. Another fitting addition is Taza Chocolate from Somerville, Massachusetts! Tracing chocolate-maker’s value chain steps, which are interwoven with old-mindset problems, Taza Chocolate’s business practices pose solutions to real-life business challenges. The following is an ethnographic analysis of Taza Chocolate, an ethical and transparent bean-to-bar chocolate maker that sources organic raw cocoa beans and turns them into minimally-processed chocolate products. To ensure continued success and growth, Taza Chocolate may get B Corp certified to grow and enlarge its mission, customer base and the movement itself, sending a strong signal particularly in such an ethical-dilemma ridden industry as chocolate production. One of the biggest concerns with chocolate-maker’s supply chains is the supply of labor needed in the farming and harvesting of its main ingredient cacao. During colonialist times, the Spanish crown granted colonists through the Encomienda system control over people and nature to extract cacao, replaced by chattel slavery as the indigenous population collapsed and disappeared. Post-abolition, non-compensated familial and child labor particularly in West Africa replaced slavery and made the Gold Coast the least expensive region world-wide for cacao as response to ever-decreasing prices paid for cacao with companies, such as Cadbury, being implicated by having chocolate produced by slave labor (Satre, 2005). Still to this day, as cacao’s commodity price changes, so does farmers’ income, making it extremely volatile (Ryan, 2011). Fairtrade certification ensures just compensation in addition to teaching communities how they can take advantage of the free market with the ideological undermining of paying famers fairer prices and raising consumers’ awareness. “Every purchase matters. Every dollar spent does economic development or destruction.” (Fairtrade, 2017) But cost of certification is shouldered by farmer and harms non-certified farmers. 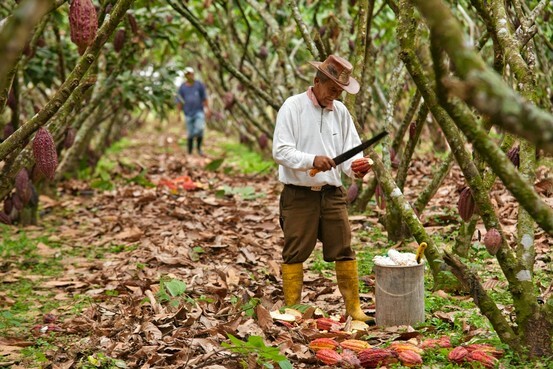 Also, farmers whet through all steps for FT certification but not enough companies buy FT chocolate with the expected income boost premium, they had to sell the rest of their cacao at bulk prices. Doubts arose as to whom FT really benefits, maybe only the US luxury consumers who can afford to pay the premium when presented with less-costly alternatives in stores. Taza goes one step further in doing Direct Trade which of course hinges on complete transparency (and Taza does publish a yearly transparency report) but also hinges on consumers trusting and being willing to pay for this extra on-top certification. In the 17th century, access to chocolate reflected the socioeconomic class leading to “snobbification” of chocolate. In a way, this still rings true today if pure organic chocolate sells for above-average selling price and therefore is only affordable for the upper middle class while the rest has to make do with the unhealthier, more implicated chocolate. Is buying ethical and the feelings associated with this superior purchase only open to richer segments of society? How can we as consumers and companies weaponize our power? According to the saying the consumers decide with each dollar spent which industries to support. B Corps offer consumers a certified and transparent way of supporting business that is socially-conscious. Fundamental structural inequality in chocolate industry with solutions treating symptoms not underlying pressures. What does work though: multi-stakeholder collaboration, transparency, grassroots approaches, sustainability on social, economic and environmental factors, shared value and responsibility, profit kept in-country as rural vibrancy contributes to national stability (Martin, 2017). Taza Chocolate’s mission is to make more transparent its chocolate-making process and therefore has solved many of the previously inherent ethical dilemmas found in the value chain. Founded in 2005 by Alex Whitmore and Kathleen Fulton, Taza Chocolate produces “stone ground chocolate that is seriously good and fair for all” (Taza, 2017) in its Somerville, Massachusetts factory. An all-around ethical, socially-conscious and purpose-driven business, history is in its name: Taza, meaning cup in Spanish, is reminiscent of the way Aztecs ritualistically consumed chocolate in liquid form using specially designed cups or vessels for this purpose (Coe, 1996). History is also found in its design and packaging displaying a cacao pod and its signature mold in the form of the Mexican millstone stone that ground the chocolate itself. Taza Chocolate’s company culture is driven by founder and anthropology-major in college Alex Whitmore who is very much standing in his purpose in building his company as he “apprenticed with Mexican molineros, learning their ancient chocolate-making secrets.” (Hofherr, 2016) and brought these to Somerville, Massachusetts. Taza Chocolate has a lean start-up-like organizational structure headed by a 8-member Leadership Team. Taza offers an easy application process opening up more opportunities in making an effort to get natives from the countries that it sources its cacao from involved in its business processes. Taza Chocolate revamped the usually long supply chain that often involved slave-labor and many parties that wanted a share of the price paid for raw cacao, and instead instituted ethical quality-ensuring Direct Trading relationships and disclosing transparency reports on each country of origin: “Our pioneering Direct Trade Certified Cacao sourcing program guarantees direct relationships with growers, fair wages and work practices on the farm, and the highest quality ingredients.” (Taza, 2017). Taza directly sources cacao from Middle and Latin America (Dominican Republic, Haiti, Belize, Bolivia) but does not source from any West African cacao-producing country. While not a native plant to Africa and riddled with history involving child slavery, foregoing sourcing from these countries and not having to ship across the Atlantic presumably keeps emission and transportation costs lower. Taza Chocolate’s commitment to high quality origin cacao is symbolized in a designated “Cacao Sourcing Manager” whose job involves managing Taza Chocolate’s ownership stakes in cocoa bean export companies such as Alto Beni Cacao Co., Cacao Verapaz, Maya Mountain Cacao and Uncommon Cacao (Taza, 2017). On the related issue of nutrition, seeing as there has been a history of contaminated chocolate, and contrary to long and illegible ingredients lists, Taza Chocolate uses few ingredients and organic sugar contrasting conventional chocolate products and discloses all ingredients on its website: “We use organic turbinado sugar (also known as sugar in the raw). Taza Chocolate is proud to partner with the Native Green Cane Project for our sugar sourcing.” (Taza, 2017). Being a socially-conscious business and revered local employer, community engagement is high on its list of priorities, also being part of the Sustainable Business Network of Massachusetts: “We have very loyal customers. We work really hard at winning them over not only with delicious chocolate but also by being a great citizen in the community, making sure we pay the producers really well and are a good employer here in Somerville. We’re trying to have a net positive impact in our community.” (Hofherr, 2016). In furthering transparency of its operations, Taza Chocolate offers Factory Store Tours: “We also practice open book management; we’re very transparent and allow people to walk through our manufacturing factory.” (Hofherr, 2016). Additionally, Taza’s stand at Boston Public Market has a traditional chocolate grinding stone on display. Taza chocolate products carry five certifications to ensure safe labor practices as well as organic ingredients: USDA Organic, Taza chocolate Direct Trade certified Cacao (own certification), Non-GMO project, Certified Gluten-Free and Vegan, whose integrity is guaranteed by having their “five Direct Trade claims independently verified each year by Quality Certification Services, a USDA-accredited organic certifier based in Gainesville, Florida.” (Taza, 2017). “Taza is big on ethical cacao sourcing, and is the first U.S. chocolate maker to establish a third-party certified Direct Trade Cacao Certification program, meaning, you maintain direct relationships with your cacao farmers and pay a premium above the Fair Trade price for their cacao.” (Hofherr, 2016). 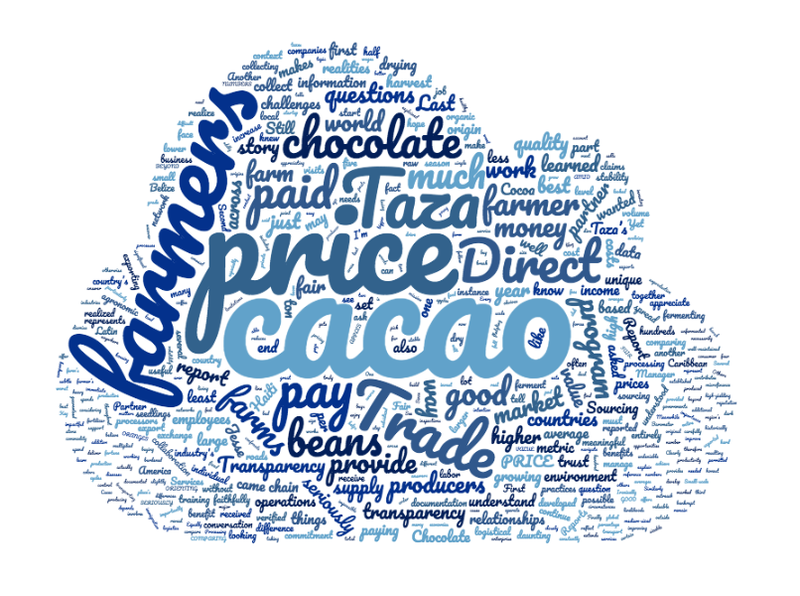 Taking the transparency one step further, in its Transparency report displayed below, Taza Chocolate discloses what it pays for its cacao beans. As self-proclaimed social enterprise company, Taza Chocolate would join the “fast-growing global network of certified businesses that have made a commitment to managing, measuring and reporting their social and environmental impact while driving sound profitability” (Bcorp, 2017). The prestigious designation of Certified B Corp certifies that the company meets a range of social and environmental business standards, as well as accountability and transparency, with a commitment to ongoing development and improvement in all these aspects of its business. Taza would join the existing 2,000+ B Corps, but would join only five chocolate-manufacturing companies (the most famous and widely available one being Tony’s Chocolonely). The scarce number of chocolate companies is probably a testament to how difficult the usual value chain of a chocolate company is to get certified and really change the status quo. Does Taza not have an obligation to grow and in so doing both mainstream this ethical offer and ensure famers have a market big enough to continue this better way of farming? Or does the mere existence and carving out bigger companies’ market shares lead to a paradigm shift in other firms too? Either way, B Corps’ network of consciously-minded business is aligned with, and can propel forward, Taza Chocolate’s mission of organic and sustainable bean-to-bar chocolate. Coe, S. D., Coe, M. D., & Huxtable, R. J. (1996). The True History of Chocolate. London: Thames and Hudson. Martin, Carla D. (2017, March 22). Class Lecture. Modern Day Slavery. Chocolate, Culture, and the Politics of Food. Cambridge, MA: Harvard University. Ryan, O. (2011). Chocolate nations: Living and dying for cocoa in West Africa. London: Zed book. Satre, L. (2005). Chocolate on Trial: Slavery, Politics, and the Ethics of Business. Athens: Ohio University Press.